Tickets to the 2019 Patty Kazmaier Memorial Award Ceremony and Brunch, set for Saturday, March 23, in Hamden, Conn., are now on sale, USA Hockey announced today. The award will be presented during a ceremony at Cascade Fine Catering adjacent to the campus of Quinnipiac University. 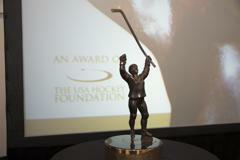 An award of The USA Hockey Foundation, the Patty Kazmaier Memorial Award is annually bestowed upon the top player in NCAA Division I women's ice hockey. Other selection criteria include outstanding individual and team skills, sportsmanship, performance in the clutch, personal character, competitiveness and a love of hockey. Consideration is also given to academic achievement and civic involvement. The award ceremony is part of the festivities associated with the NCAA Women's Frozen Four, which will take place at People's United Center in Hamden, Conn.
Top-10 finalists for the award are expected to be announced in late February, with the top-3 finalists announced on Feb. 28. NOTES: Individual seats to the event are $65, while tables of 10 are available for $600. A select number of event sponsorships and program advertisements are also still available. More information can be found here. The Patty Kazmaier Memorial Award is supported, in part, by a grant from the NHL Foundation.